Dr. Miller is a southern California native and moved to this region by way of Washington State in 1993. She graduated from Daniel Boone HS and then went on to earn her Bachelors of Science from the University of Tennessee, Knoxville. Rhiannon completed her Doctoral of Dental Surgery at the University of Tennessee Health Science Center, College of Dentistry in Memphis, TN. 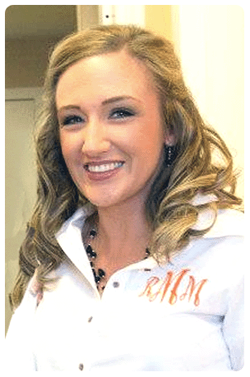 After graduation, she returned to our region to serve the dental needs of east Tennessee and marry her high school sweetheart and East Tennessee native Ben Miller. Ben’s family has resided in this region more than 50 years and they are proud to call East Tennessee home. Dr. Miller has had the privilege of watching the Boones Creek area grow into a thriving community and is excited to open her practice and become an integral part of this community. When she is away from her patients, Dr. Miller enjoys riding and competing in eventing with her horse ikemurphy. She also enjoys camping, hiking, 4wheeler riding and shooting with Ben.